Review posted March 12, 2015. Feiwel and Friends, New York, 2015. 36 pages. Okay, this is the cutest bedtime book ever. I showed it to a usually cynical friend, and even he told me I had just made his day better. The photos accompanying this simple text could not possibly be more adorable. 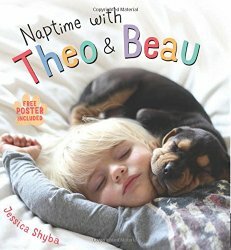 A toddler boy (Beau) and a dog (Theo) got in the habit of napping together. Mom (Jessica Shyba) took their pictures. The two young creatures are roughly the same size. They sleep cuddled up together. You know how nice it is to watch a child sleep? It turns out it can be even sweeter to see a child sleep cuddling up with a sleeping dog. You can see more photos, now with Beau's little sister, on the author's Momma's Gone City blog. In a book? Well, besides being adorable, looking at these pictures will also make you sleepy, which, it seems to me, is the perfect criteria for a bedtime book.